Some plants, introduced by humans outside their native range can grow faster than native species and may have no natural predators so can spread quickly. These plants are invasive non-native species. They can compete with and displace native species, spread disease, alter local ecology, lessen biodiversity and clog waterways. This adversely impacts recreation by affecting water quality, fishing and navigation. 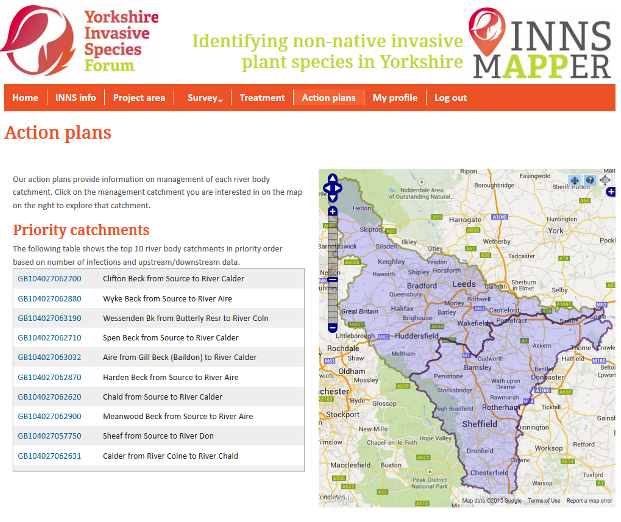 Yorkshire Wildlife Trust have recently launched INNS Mapper, a recording project which maps the invasive non-native plant species affecting the river waterways of the Don & Rother and Aire & Calder catchments. The website uses data captured on the species distributions, survey effort and treated stretches of river to provide prioritisation of the river body catchments which urgently need treatment. It uses custom Indicia mapping code to allow the easy entry of the river stretches that have been surveyed and treated.